When tax time rolls around, it is incredibly important that you keep meticulous records of your finances that you are able to produce. You run the risk of being audited, and always want to make sure that you have records to show that you deserve tax write offs whenever necessary. When this is what you are looking for, you should lean heavily on spreadsheets and similar tools to allow yourself the opportunity to produce clean, concise records. When this is what you need, you are in luck. On this site, you have the opportunity to download a free charitable donation receipts template Excel spreadsheet that lets you create a receipt for your charitable donations. Perhaps you made some donations at the local Goodwill store. Or maybe you donated cash to your favorite local non-profit organization, but were not given a receipt to speak of. If this is the case, you should do everything in your power to make sure that you utilize the charitable donation receipts template spreadsheet, which will help you make the most of your transaction. When this is what you need, you can rest assured that the form we have is completely free and able to provide you with everything that you need. When this is what you are looking for, make sure that you download it in enough time for tax season, and store your files away in multiple locations, both digitally and hard copy. This way, you are able to make sure you are taken care of once it is time to pay Uncle Sam what he is owed. 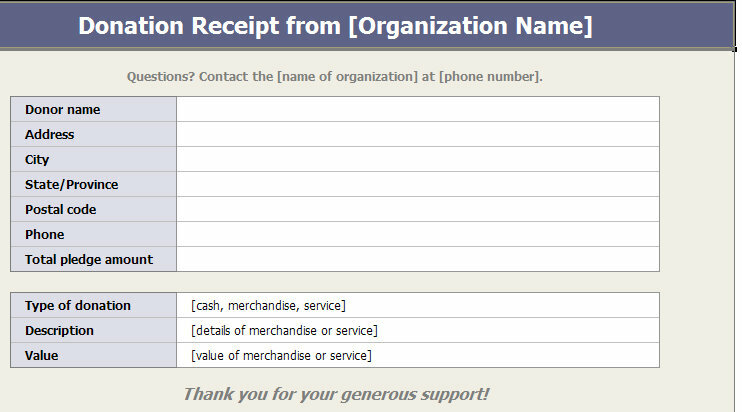 The best part about this charitable donation receipts template is that it is completely customizable and able to provide you with information that is accurate. This charitable donation receipts template will give you the help needed for your bookkeeping purposes. 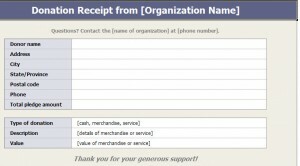 Whether you plan on using this charitable donation receipts template or not, you are doing yourself a favor by having it available to you for record keeping. You cannot afford to keep sloppy records, so make sure that you do everything that you can in order to give yourself the best shot at keeping accurate records. This will help you during tax season and for both business and personal reasons. would you happen to know where I could go to get donation receipts printed out for me? You can go to FexEx online and upload the receipt you downloaded on 9/19. They can print the receipt for you and schedule a time for you to pick them up.